10 ft long vinyl-coated speed rope. Flexible non-kink design. Adjustable length to accommodate any height. 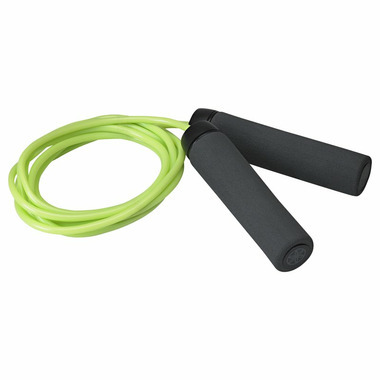 Contoured foam handles provide comfortable, secure grip. Ideal for cardio and strength training workouts. If you're looking to learn to jump rope, skip (!) this and find a weighted rope. The plastic will not straighten out and the handle loosens. This product comes wrapped and folded, the creases in the rope will not straighten out. After 10 minutes of use the handle came unscrewed. I do not recommend this product.